January 2nd, 2013 - This marks our first article in 2013. We are heading into the new year with an overflowing amount of positive vibes for what's ahead, so we're examining 10 amazing projects coming to realization in our near future! That's right, What does 2013 have in store for us? With great talents such as Zaha Hadid and Henning Larsen We're seeing curves like we've never seen them before. The Danish architects over at BIGare taking their name to a whole new level as they recently unveiled their extraordinary Phoenix Observation Tower, which will have people flocking in from all around the world to experience. A hotel built into a mountain deep into the desert, why not? Florida-based Oppenheim architects will be working to build out their Wadi Rum Desert Resort which is designed to devise a new contract between man and nature. The idea of connecting man and nature through architecture has been a long standing concept through history, but in 2013 we will be seeing this idea manifest in a whole new way - in the sky, desert, jungle, and water! Oppenheim architects have designed a series of beautiful tree top villas with the intention of integrating nature as as a major ingredient of the material palette. The team explained that "the architecture is reduced to the essential components for shelter—amplifying the ever-changing sky, water and vegetation that define the experience." The elevated position of the structure allows for them to have little impact on the ground plane letting the undisturbed natural landscape to flow under them as an integral part of the design. These villas were originally designed for the Mandarin Oriental Group on a private island in Turks and Caicos, but as the concept has been widely admired, Oppenheim is in early works to build a similar piece elsewhere. The Goldstone Winery in Dalian City of the northwestern portion of China, is an angular new build by the architects at OSO Studio Limited. This new take on a 'wine house' is a cool juxtaposition to the rolling hills of grapes and shrubbery. The architects said that they "developed a set of diagrams to define the building within the intersection of natural context and architectural typological." First, the team proposed a semi buried volume to meet the physiognomy of the site; building’s two boundaries and contour lines coincide, another two boundaries’ angle are adjust carefully to make the building seems meet the entire site program arrangement “accidentally”, respect the nature context and declare its existence. Oppenheim is bursting at the seams with a collection of jaw-dropping new projects, we couldn't help but feature another one. The Wadi Rum Desert Resort in Wadi Rum, Jordan will be a 80,000 square foot hospitality experience for design lovers, adventure seekers, and people who want to re-connect with nature. Oppenheim's mantra for the underlining concept of the project is "to live in harmony with the natural world, we must learn how to re-engage the land." The idea led to the creation of a powerful and primitive resort which is built into the mountain side. This project is set to start construction soon - we're hoping to see it built in 2013, but it will be well worth the wait if it emerges the following year. AS. Architecture-Studio projected Cultural Center of Muscat, Sultanate of Oman, will bring together the country's National Archives, the National Library and the Omani National Theatre all under one roof. The center is covered by a rolling canopy in a jungle-like setting between the sea and the mountains. The palm filled oasis is designed to be a connecting link between the past and present of Muscat. The Mobius' House by Planning Korea, is to be built as a two-story leisure house with a curved roof securely nestled into the Gotjawal Forest. The form of the structure appears to be a continuous ribbon wrapping around the home with a side of the house that has full glazing to provide amazing forest views. The Mobuis' will be stand-out house in the near future, and will help continue the exploration of unique residential designs in the industry. We're looking forward to the completion of SaundersTorngasok Cultural Centrein 2013, as the curvy monolithic structure takes on a new-age form combined with local natural materials. The building's windows are undefined, but exist only within the vertical wood slats which create the exterior walls. The center sits in between a lake and the mountains and will be used as a large exhibition area, auditorium, café, craft shop, and an artist studio. 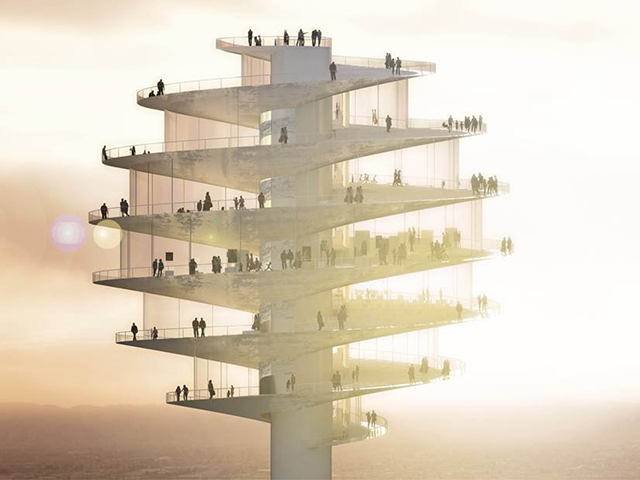 This is nothing new for Denmark-based BIG Architects who went big with their new Observation Tower in Pheonix, Arizona. The founder of BIG, Bjarke Ingels, and his team have been responsible for some ground breaking pieced of architecture in the past 7 years, and Ingels is not about to stop now. 50 years from now, we will look back at Ingels as on of the most pivoting talents in architecture, and we are lucky to witness his work live! This year will mark the beginning of construction of the sky-giant known as the Phoenix Observation Tower. The 70,000 square foot deck is a slender reinforced concrete structure with a large spiraled sphere on top. Once visitors make their way to the top of the structure, they will be able to experience 360 degree views of the desert as they walk around the corkscrew deck. We're not going to lie, we're going to have to put on our big boy pants to go up the tower, because we're getting a little scared just looking at the renderings! Henning Larsen Architects The Massar Children’s Discovery Centre will be the heart of a Syrian educational program - Massar. The center will through science-based, hands-on experiences offer activities to empower young Syrians to contribute actively in building their future. The discovery centre has a unique location in the heart of Damascus. The building comprises exhibition, library, education and administration space. The centre will be an integrated main attraction within a new 170,000m² public realm on the site. The form is inspired by the unique Damask rose. The proposal suggests a shell structure allowing a playful and dazzling scenography of light into the interior spaces - like light filtering between rose petals. Exhibition and administrative areas are laid out between the rose petals creating interior labyrinth journeys inspired by walks in the old city of Damascus formed by walls with the sky as the window! Another exciting project to come in 2013 is the Water Discus Hotels,which consists of two structural discs - one underwater and one above-water. This combination of the two will allow guests to admire the depths of the ocean while making the most of the warm climate. The two parts of the structure are connected by five solid legs and a vertical shaft containing a lift and stairway. One of the top discs will be a helicopter pad that will bring guests to and from the hotel. The creators of the project is D.O.T. (which stands for Deep Water Technology) started only two years ago with a specific goal to explore underwater living. The complex is surrounded by a beautifully vibrant coral reef. This unique location will allow you to enjoy the tropical weather and the colorful underwater world, which is just within your reach and will engage all your senses. Los Angeles is known as the birthplace of American modernism with boxy homes flourishing through the 60's and 70's designed by the likes of Frank Lloyd Wright and Rudolph Schindler. This coming year, Oppenheim will be taking this idea of L.A. modernism to a whole new level. The Bel Air Villa is immersed in the hillside with clear views of both the Los Angeles and the Santa Monica mountain ranges. The house breathes some fresh air into the linear mid century feel by stacking two of the rectangular structures on top of one another, introducing a roof top garden, and a dramatic two-level swimming pool that flows like a waterfall!